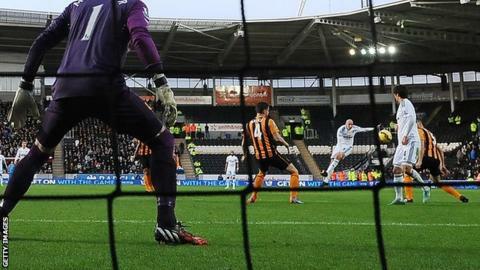 Ki Sung-Yueng's fortuitous goal was enough to give Swansea a Premier League win over Hull City at the KC Stadium. Jonjo Shelvey's long-range strike deflected off the South Korean's wrist to beat goalkeeper Allan McGregor. Hull threatened to equalise when Andrew Robertson drove against the crossbar but the Swans squandered further chances and twice struck the woodwork. The victory moves Swansea up to eighth and leaves Hull, who are without a win in 10 games, second from bottom. The pressure is mounting on Tigers' boss Steve Bruce, who lead the club to promotion during his first season and the FA Cup final in his second, with Hull having won just one game in front of their home fans this term. The Swans headed into the match on a run of two defeats and with a hectic Christmas schedule on the horizon manager Garry Monk opted to make seven changes to the side that narrowly lost 2-1 to Tottenham last weekend. Shelvey came in to replace Leon Britton, who was nursing a knee problem, and the Englishman enjoyed an influential game against a Hull midfield missing the suspended Tom Huddlestone, who was serving the first of a four match ban. And it was Shelvey's long-range shot on 15 minutes that deflected off Yueng to open the scoring. There were only muted appeals for handball from the Hull players and an eerie hush from the deflated home fans. But Swansea have given away 16 points from leading positions this season and they may have feared a repeat when Robertson rattled keeper Lukasz Fabianski's crossbar with a dipping strike just minutes later. Steve Bruce's side slumped to their eighth defeat of the season. However, the Swans reasserted themselves and could have doubled their lead on 31 minutes when Shelvey, whose only goal this season came against Chelsea in September, beat McGregor with a 25-yard daisy-cutter that struck the inside of the post and went wide. Bruce made changes after the break, throwing on strikers Sone Aluko and Yannick Sagbo but it was the Swans that looked the most likely to score. French striker Bafetimbi Gomis, starting in place of the club's top scorer Wilfried Bony and seeking his second league goal of the season, volleyed narrowly wide of the top corner and then hit the post with a slow, looping effort after battling to get between two Hull defenders. Hull had a penalty claim denied in the dying seconds when Sagbo claimed he had his shirt tugged in the box, but appeals were to no avail. "There are no excuses, there was nothing in it in the first half. But the deflected goal sent us backwards. In the second half we got what we deserved - which was nothing. We have to be bigger and better all around the pitch. "This afternoon, the more we tried the worse we got. Swansea didn't have to do too much to win the game and we didn't do enough. "It would have been a soft penalty [at the end of the game] if we had got it but we need something to fall for us. We need a shot deflected in like Swansea's to turn us around a bit. "There is always scrutiny on Premier League managers and if you go six, seven, eight weeks without a victory then it is your turn. But you go on. We need something to turn for us and I'm still convinced we will be okay." "We defended extremely well and I can't really remember them having a clear-cut chance. "It was always going to be tough to get the flowing football we wanted but when you look at the chances we created we could have had a few more goals. Three points is the most important thing. "We have to push on, we have been in the top half all season. We must keep improving and cement ourselves in amongst it. "We don't want to be looking over our shoulders, but hunting the teams in front of us." Hull City have not won in 10 Premier League games. Match ends, Hull City 0, Swansea City 1. Second Half ends, Hull City 0, Swansea City 1. Foul by Gastón Ramírez (Hull City). Corner, Swansea City. Conceded by James Chester. Attempt blocked. Wilfried Bony (Swansea City) right footed shot from outside the box is blocked. Assisted by Jonjo Shelvey. Foul by James Chester (Hull City). Wilfried Bony (Swansea City) wins a free kick on the right wing. Foul by Yannick Sagbo (Hull City). Lukasz Fabianski (Swansea City) wins a free kick in the defensive half. James Chester (Hull City) wins a free kick in the defensive half. Attempt saved. Wilfried Bony (Swansea City) header from the centre of the box is saved in the top centre of the goal. Assisted by Angel Rangel with a cross. Substitution, Hull City. Yannick Sagbo replaces Nikica Jelavic. Substitution, Swansea City. Angel Rangel replaces Ashley Richards. David Meyler (Hull City) wins a free kick on the left wing. Attempt missed. Nikica Jelavic (Hull City) left footed shot from outside the box misses to the left. Substitution, Hull City. Harry Maguire replaces Curtis Davies because of an injury. Substitution, Swansea City. Wilfried Bony replaces Bafétimbi Gomis. Attempt missed. Curtis Davies (Hull City) header from the centre of the box is high and wide to the right. Assisted by Gastón Ramírez with a cross following a corner. Corner, Hull City. Conceded by Ki Sung-Yueng. Sone Aluko (Hull City) wins a free kick on the right wing. Marvin Emnes (Swansea City) wins a free kick in the attacking half. Hand ball by Nikica Jelavic (Hull City). Attempt missed. Federico Fernández (Swansea City) header from the centre of the box is too high. Assisted by Jonjo Shelvey with a cross following a corner. Corner, Swansea City. Conceded by Andrew Robertson. Delay in match Neil Taylor (Swansea City) because of an injury. Sone Aluko (Hull City) is shown the yellow card for a bad foul.